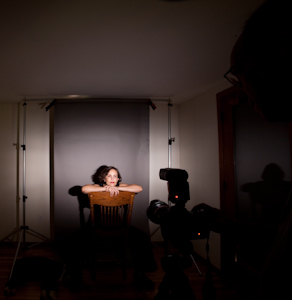 A small flash mounted on the camera pointing right at the subject usually produces a "police photo" look — harsh and documentary. This is how tabloid photos often look, and they are not flattering. 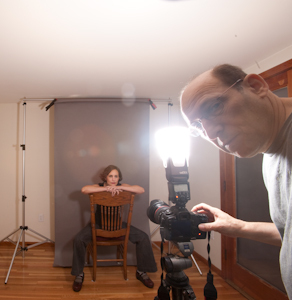 Here we explore different devices you can use to soften the light coming from a direct flash. There are even some little diffusers available for compact cameras that try to soften the light from the tiny built-in flashes, which might help a bit. Under each photo is an image from a second camera of what the light in the room looked like when the photo was taken — you can see how larger lit areas look softer than small lit areas. 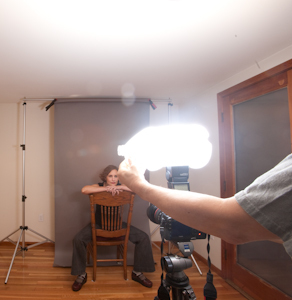 Bottom Line: Try to soften the light from an on-camera flash, unless you like the tabloid look. Direct flash — what I refer to as "police photo". This is the look you see on movie stars in supermarket tabloids — a gritty look. You might want that look. 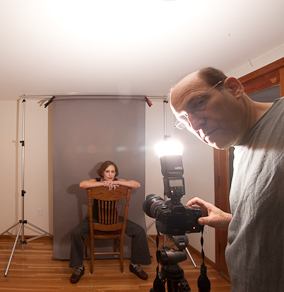 Notice that the color of direct flash is often colder than flash that is put through a diffuser. 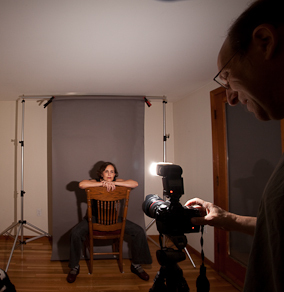 Adding a wide-angle "lens" in front of the flash illuminates the whole room — with the white walls bouncing light all around, it creates a MUCH softer light than the naked flash. 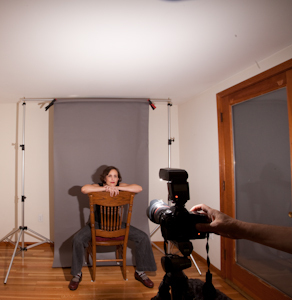 Mini soft box, often used in weddings where there IS no ceiling to bounce light off. The bigger the better with these devices, but things get clumsy with a 16-inch soft box perched on your camera. The Stofen diffuser used to soften a direct flash is much less effective than bouncing it off a white ceiling and/or wall. Ceiling bounce, for reference. 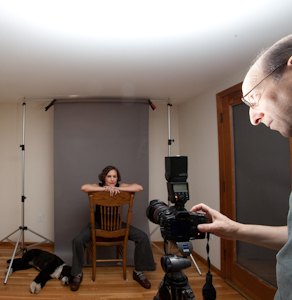 It is useful to compare these other methods with a flash bounced off of a white ceiling. I like the quality of light, but a ceiling bounce without something to send some direct light does not put a "catchlight" in the eyes, which can be a problem. The Fong Dome is a legendary device that many photogs feel has mystical powers to create good light in tough situations. In THIS comparison it doesn't look much different than the Stofen box, but this is just one situation. The Stofen box, when aimed up does a good job of mixing some softened direct light with much bounce light. Compare to the larger, more expensive Fong Dome to the right. 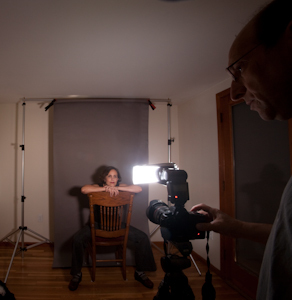 The white frosted jug: as good as, and cheaper than all other on-flash diffusers. But are you going to walk around with one of these stuck on your flash?